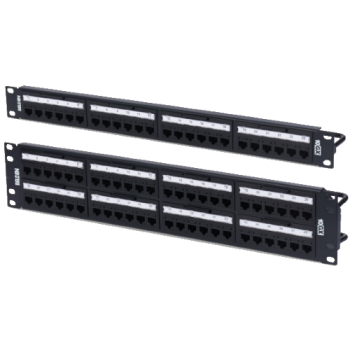 Belden KeyConnect Modular Keystone Rack Patch Panels are perfect for use with Belden REVConnect RJ-45 Keystone Jacks and Belden Fiber Keystone Jacks. KeyConnect Patch Panels are robust all-metal modular patch panels that provide a flexible, versatile and high-density termination solutions for Data Center, Telecommunications Room, and Commercial and Residential installations. 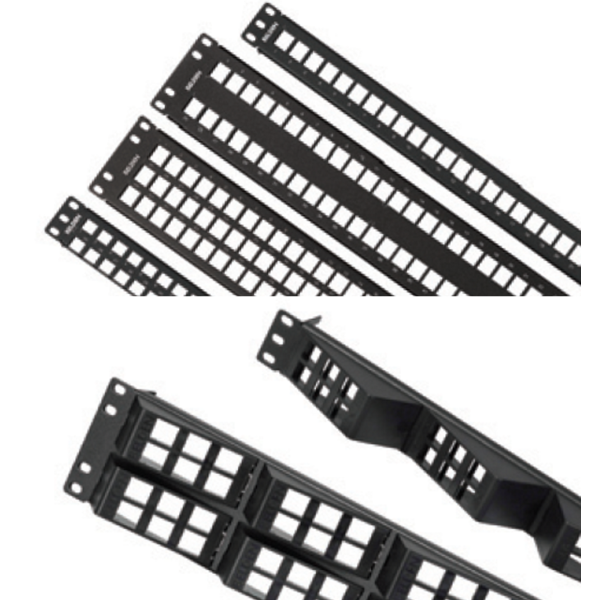 Also available are the unique AngleFlex Patch Panel. Patent-pending removeable angled inserts provide intuitive left, right or bi-directional patch cord routing and more efficient switch connection. Angled inserts eliminate the need for horizontal cable management, for a 27% space savings per rack, and where space is limited behind the panel. The modular KeyConnect and KeyConnect AngleFlex Patch Panels are available in 24-port/1U and 48-port/2U configurations.